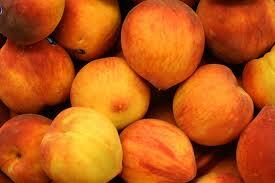 Ladies and Gents, I’m pleased to announce it is once again peach season. I’ve seen them at grocery stores and markets for a while but it wasn’t until this week that I actually made the purchase. I bought 3 peaches from a local farm knowing I needed to give them a few days bundled in a paper sack on my kitchen counter before I could savor their sweetness. Luckily, I’m blessed with patience (ha!). I opened the paper bag this morning and my kitchen was immediately filled with the loud, peach fragrance. Today was the day I had been waiting for. I rinsed off my stone fruit and took a bite. I already knew to lean over the sink because these are chin-drippin’ peaches, make no mistake. It was delectable, enjoyable, amazing, delicious! I’ll post some peachy recipes later this summer but for now… I urge you, my reader, to go the farmer’s markert in your neighborhood and buy at least 1 peach, heck make it 2!